Nelson and Colne College Sixth Form are celebrating the amazing success of their staff and students this A Level Results Day as they maintain a 100% pass rate for the fourth consecutive year! 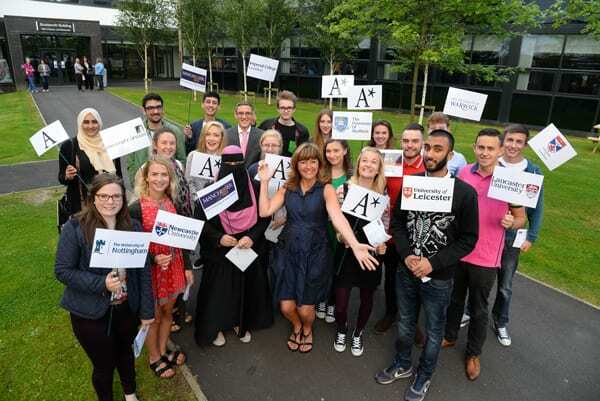 A quarter of students at the College have achieved coveted A* to A grades, while many are going on to study at top universities across the UK, including the University of York, University of Warwick and University of Newcastle. And despite national reports suggesting a decline in top grades in Physics, Biology, and Chemistry, NCC students have bucked the trend – with the percentage of A* to B grades in all three subjects rising. These excellent results build on the College’s ongoing success at having been chosen as part of an elite and small group to be awarded STEM Assured status – an industry-led kite-mark for excellence in Science, Technology, Engineering and Mathematics. In Maths A* to B grades have impressively increased by 17% from last year. Nelson and Colne College Principal Amanda Melton said: “I am delighted that the hard work, commitment and dedication of our outstanding students has paid off and that once again we are able to celebrate a 100% pass rate. “We have seen an overall rise in top grades, and a special thank you must also go to our wonderful staff, whose commitment to exceptional teaching never fails to amaze me. “Seeing our students progress from secondary school leavers to young adults ready for University or employment is an absolute joy, and we wish each and every one of them the best of luck on their next journey. We hope they stay in touch as part of our alumni network, and go on to inspire the next set of students ready to join the NCC community. As well as boasting excellent teaching, support, and facilities, Nelson and Colne College is dedicated to offering students an “overall” experience and helping them to stand out from the crowd when applying for universities and updating their CVs. The College’s small, caring and welcoming environment has been experienced by generations of families within East Lancashire –many of who have gone on to achieve challenging and worthwhile careers. Nelson and Colne College has been graded as Outstanding by Ofsted since 2005, is also a Learning and Skills Improvement Service (LSIS) Beacon College, and has been placed in the top 1% of Colleges in the country. If you have picked up your results and need some advice from our expert team contact 01282 440 209 or ring the Department for Education’s Exam Results Helpline on 0808 100 8000. You can also find them on Twitter @ERHelp and on Facebook at www.facebook.com/examresultshelpline.